Arrive in Quito. Meet and greet with your bilingual guide; then transfer to the Patio Andaluz hotel. Two nights, in double room, including breakfast, hotel tax and service charge. This interesting and renovated city tour starts with a visit of the Itchimbia neighborhood, which is a place that offers a spectacular view of the old and new city. Then you will visit the old colonial Quito starting in Santo Domingo Plaza walking through one of the oldest streets in the town “La Ronda Street” where you will see how the colonial houses were built and how the Quiteños lived in the 17th century. Your walk takes you through the city museum to San Francisco Plaza, making a quick stop to try the typical sweets of Quito. San Francisco is the oldest church in Quito and it is full of history and legends. Finally, you will tour the main square where the presidential palace, the main cathedral and some other important buildings can be appreciated. La Compañía de Jesus church is one of the most beautiful churches in South America, or perhaps, in the world. This is the last treasure to be visited in our program before your guide takes you to the equator. Once there, you will visit a very interesting museum, INTI NAN, where you will learn about the different cultures in Ecuador and some interesting facts about the Equator. After breakfast, take a spectacular route along the gorge of the Pastaza River to the town of Baños, right at the foot of Tungurahua Volcano, from where the thermal waters that gave it its name emerge. Drive along the Route of the Cascades to El Pailón del Diablo (the Devil’s Cauldron) where the most adventurous will descend (medium difficulty) to observe the impressive cascade up close, surrounded by subtropical vegetation. The force and sound of the waters can also be appreciated from a lookout point without descending. Lunch is served at an hacienda / hostel in the surroundings, and in the afternoon you will enjoy a short stroll along Baños, a town with an international pulse, full of people from all over the world as well as many locals who take pilgrimages to the Sanctuary of the Virgin of Holy Water. From here, the route to Riobamba climbs up the mountain, to where the clouds can be touched, alongside the massive Chimborazo, the highest mountain of Ecuador, on the high paramo where vicuñas graze and scamper – this is a protected Fauna Preserve. On the hillsides, where the land is worked beneath the plow, one might think the farmer’s true objective was to paint the hills in fascinating patterns, not just to till the dark, fertile soil. Great photo ops on this route! Arrive to Riobamba and check into the Abraspungo Hotel. One night, one room (double occupancy), including breakfast, hotel tax and service charge. This day you will wake up very early to be on time at the train station. Train journeys in Ecuador are a sure adventure, the Trans-Andean Railroad is a spectacular tourist attraction for the variety of climates and fantastic natural and cultural scenery along the journey. Moreover, the trains themselves are a colourful part of the landscape. 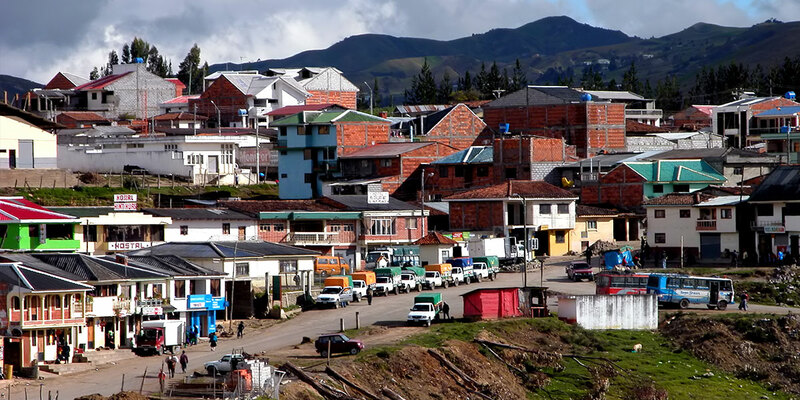 On your way to the train station in Alausi, drive by Cajabamba and the Colta lagoons, and the small Guamote village then climb to a little picturesque town in the highlands called Alausi, which is the beating heart of the rehabilitation of the Ecuadorian Railway Company in the last years. Great effort has been made to restore the 100-year old train to its old glory and romance. From Alausi comes the most exhilarating part of the journey; said to be one of the most spectacular portions of railway in the world. The train zigzags up and down 45 degree gradient called “Devil’s Nose” in a breathtaking way. The train goes backwards on the way down, arriving to the station of Sibambe where you will have some time to wander around. The train then goes back up the Devil’s Nose to return to Alausi. After the train ride you will continue driving south towards Cuenca with a stop at the Ingapirca ruins. Ingapirca means “Incas stone wall” and it’s the most important archaeological site in Ecuador. The massive fortress of Ingapirca, a complex built by the Incas on top of an old Cañari settlement, is the only remaining of a major monument of the Inca Empire in Ecuador. You will arrive to Cuenca where you will stay two nights at hotel Santa Lucia in one double room incl breakfast and local taxes. Note: If the train is not available on this day, we will continue the tour by car. Cuenca was declared a UNESCO World Heritage Site in 1999. It is the third largest city in the country and is referred to as “the Athens of Ecuador” for its many contributions to the field of literature. The city is located in the southern part of the country and is crossed by four rivers which give it a unique landscape. The historic centre is the most visited site in the city because it dates from the 16th century. The architecture is an eclectic mix of European styles, mainly Spanish and French. Stroll through the cobblestone streets to visit the various squares housing churches, flower markets, and Panama hat makers! After lunch you will have time to explore the city on your own. After breakfast, drive out of Cuenca to the Cajas National Park. The tour will begin with a walk through a beautiful, glacial valley (elevation: 3,100 meters). This part of the park is a cloud forest, and home to a wide array of birds. Forests are rare at elevations as high as 4,000 meters, however El Cajas National Park is home to quinua forests, also known as “paper tree” forests. The bark of this tree is literally paper thin. In the afternoon, you will continue on to Guayaquil and check-in at hotel Wyndham, one night, one room (double occupancy), including breakfast, hotel tax and service charge. Pick up by your guide at the hotel front desk & transfer out for your flight home.